IN A DISPLAY OF DEFIANCE, Vladimir Putin sent Russian Patriarch Kirill on a ‘religious’ mission to Syria on November 15 2011. “God will protect the Syrian people from bloodshed,” declared the Patriarch after touchdown in Damascus in preparation for his meeting with Syrian leader, Bashar al-Assad. The Patriarch’s visit was a clear signal to the Jewish-controlled West that Putin will checkmate Zionist schemes to bisect Syria into pro and anti Assad entities. For on November 28 2011, a group of military officers from NATO and the Persian Gulf established an operational command at Turkey’s city of Iskenderun on the border of North Syria with plans for military intervention. This Nato contingent hails from the US, France, Canada, Qatar, Saudi Arabia and the United Arab Emirates, with Turkish officers providing liaison. View Entire Story Here. IN YET A FURTHER DEFIANCE of Jewry’s designs on Syria, on December 1st 2011, Putin delivered to Syria the first of 72 Yakhont supersonic anti-ship missiles designed to break any sea blockade imposed on Syria. 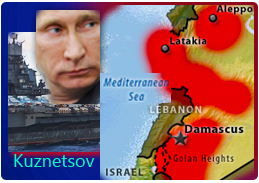 And the Yakhont missile can target US and Israeli vessels blockading Syria’s shores at a distance of 300 kilometers. The nuclear-armed US carrier strike force, the USS George HW Bush, arrived in the Mediterranean bordering Syrian waters on November 23 2011 in the wake of the three Russian warships anchored earlier opposite Tartus which established a command post in the Syrian port. The Russian warships will be augmented by Russia’s class aircraft carrier, the Admiral Kuznetsov, which is due to be in harbor by December 10. The Kuznetsov carrier and its accompanying strike vessels will enter the very same Syrian offshore waters as the USS Bush and the US Sixth Fleet, which is permanently posted in the Mediterranean. Indeed, a face-off between the superpowers is now in the making. BACK TO THE FUTURE vis-a-vis the Syrian crisis brings the Cold War of yesteryear into the present with the fear of a possible launching of World War 3. A potential conflagration between the two superpowers is reaching frightening levels in the Mediterranean with vessels of both the US and Russia maneuvering for battle positions. Precipitated by the Jewish-run US State Department’s decision on November 23 2011 to sever its treaty with Russia in exchanging information on troop deployments, Moscow is now engaged in drawing a line around Assad’s presidential palace in Damascus. In Kristol’s and Kagan’s paper, “Towards a Post-Assad Syria,” (with their blood lust still running afresh from their Jewish pens), the two diehard neocons demanded that Obama institute “crippling sanctions” on the Assad regime, provide assistance to Syrian opposition groups, and impose a no-fly zone over Syria. But Jewry has now met its match. Its nemesis, Vladimir Putin, is warning the Jewish led-by-the-nose US and NATO that they will not be allowed to repeat their feat in Libya of overthrowing Muammar Gadhafi by ousting Syria’s president Bashar al-Assad. “Armed groups that maintain contacts with a host of Western countries are provoking the unrest. Everyone knows this.” View Entire Story Here. Indeed, it is a KNOWN FACT that Israel and its colony, the Zionist States of America, have been undermining Assad’s regime by equipping ‘protesters’ with arms and money. “THE RUSSIANS AREN’T SUCKERS,” Brzezinski once remarked with regard to Moscow’s opposition to the Jewish Lobby’s war mongering schemes in the Middle East. And Vladimir Putin, who has the ability to leave the Jewish-controlled West gasping for air, can land the deadliest sucker-punch of them all. The Christ-hating Talmudic commandos are terrified of Vladimir Putin and reading what they put up in their Jewsmedia makes this pretty clear. 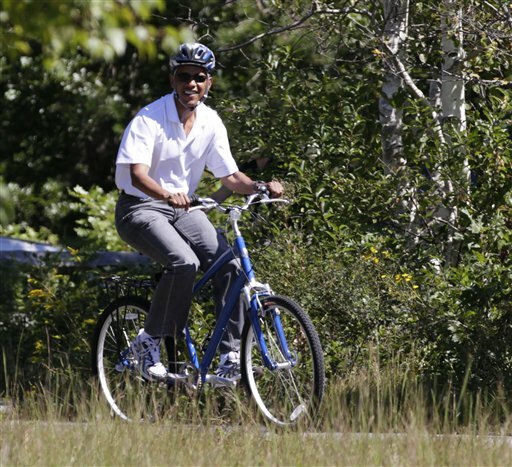 Don’t worry American sportsfans, Barry will save you from steely-eyed Vlad. KIRK got us off to a GOOD START by his ON TOPIC post. 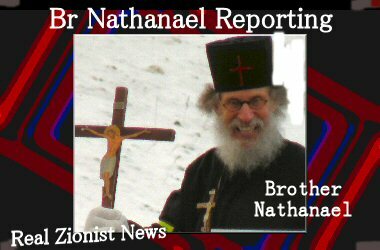 Not only that Brother Nathanael, those sick bastards want to take control over Russia and see Putin gone. Read the whole truth here, wake up people, support Brother Nathanael while we still have some freedom left. You may have answered this question before but what is up with Brzezinski? He is a Jew yet he consistantly warns of their miss-stepping. Is he a false flag, window dressing, controlled opposition, or has he been banished from the inner circles of the NWO? If you have a previous post please refer to its URL. Just have a GOOD LOOK at his eyes and face…. I bet the press is writing the script on how evil the Russians are and the threat they are to our way of life here in the Bankrupted United States of Israel…What a joke. This Chess Board is about to get real interesting. Brzezinski is not a Jew but rather a Polish Catholic. Zbig is not a false flag nor controlled opposition. The man PUTIN is ONE FOCUSED DUDE! There is nothing corrupt in his face BUT he reflects the manly and healthy countenance of a pious Orthodox Christian. A lot of these criminal actions by ‘NATO’ have a lot to do with Rothschild controlled banks. Iraq, Afghanistan, and Lybia didn’t have a Rothschild central bank. They do now. That leaves Sudan, North Korea, Venezuela, Iran, Syria, and Cuba. I think this list is correct, but with so much happening I could be off on a couple. The Rothschilds want total control of every person on this planet but, they themselves are demonically controlled. Putin needs to be firm. THANK YOU THANK YOU THANK YOU for being the voice of clarity and truth!! You are SO on top of things!! We all know that England bows before the bankers in the City of London. Putin controls the natural gas that heats the City of London. England is the last stop on the gas line. Great Britain is expected to have an extremely cold winter. Things could get chilly. The great hope of much of the world is that America collapses before it can destroy any more countries. Israel is rabid to speed up the wars before the collapse occurs. Putin doesn’t need to buy much time. The USSA can’t afford to fund another useless, corrupt, armed conflict. With the bankster bailout alone, and the 23 trillion it cost Amerika-that’s around 76k/person (counting the 300 million Americans and not the 30 million+ Javits promoted “aliens”). What can Christians do to stop these unethical, crony “capitalism”/corporate fascism (and NOT a true free market) foreign military/political entanglements? There has been enough waste of capital, time, and life to serve these crony, elitist, interests. If Maj. Gen. Smedley D. Butler was calling war a racket after WWI-how much worse has it became today with a much weaker, restless, immoral population? We are far too deceived today. Pray God would awaken our blind hearts. I can’t tell you if Brzezinski is genetically Jewish or not. He says he is a Catholic but many Jews say they are Catholic. But what I can tell you about Brzezinski is that he is BEST friends with Henry Kissinger. I think that should tell you a lot. We must remember that at the end of the day, wheter the American people like it or not, their banker (not China) could just push the PANIC BUTTON!!! God Bless Vladimir Putin and the noble Russian people. I would also like to thank you, dear Brother Nathanael, for opening my eyes to the truth about Putin and his church. Like most other people in the West, I thought he was an evil dictator. But you made me realize what a great man and devout Christian he truly is. I have for sometime now told the truth about Putin to all my family and friends, and they too are beginning to see what I see. Hope this is not off topic, Erdogan was mentioned in the text, a short remark to Erdogan. 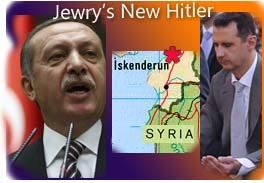 I don´t think that Erdogan is a secret Jew or in cahoots with them. He is an Islamist who was even in prison for his believes and he has clearly imperialistic aims. Erdogan is trying to undo the work of Ata Türk and converting Turkey into a Islamic state. It was Ata Türk who probably was a Crypto Jew. He brought Turkey into line with the West and made secular reforms. He was born in Thessaloniki which was called “Little Jerusalem” at that time because 50 % of the population were Jews. “Laïcité” was until lately reason of state in Turkey. Erdogan replaced some months ago many military heads who traditionally had been the keeper of this Laïcité. Since Erdogan is undoing everything what Ata Türk did I dont think he is a Crypto-Jew. But he is clearly no friend of the Western World. Since he has imperial ambitions it could be that Turkey will get trouble with Russia some day. They propably don´t allow the rise of a new big power before their front door. Putin is brave. I hope others can follow his lead. I don’t think he’s planning on serving Cold-War leftovers for this meal. The rule here is ‘don’t bite off more than you can chew’. Maybe, eventually, the super-powers will figure out that the little guy in the corner has been the cause of all of their collective misery…and deal with him accordingly! The comments section keeps me hopeful. Your crusade is awesome…you are getting the word out there. Israel, Amerika & England are (now) the “Allied, Zionist, AXIS OF EVIL” in the world today. If Israel didn’t exist - NONE of this would be happening today! I’m sure the entire world would have been quite happy to give them (the Jews) all of New Zealand (they could have even relocated the wailing wall, stone by stone, and take it with them if they wanted) - to live in peace and security - but separated from the rest of humanity (for theirs as well as our own good). With all of the mountains to quarry they could have built themselves a brand new temple as well. But, no, they had to go and steal someone else’s land - by violent force - and then proceed to destroy all the neighboring countries around them just so THEY could feel more ’secure’ (with even more spies and assassins in every other country around the world). There will NEVER be any peace for anyone as long as they stubbornly insist on reshaping the entire world to their OWN liking (to the detriment of the rest of us 99.8% of humanity). They’re “not right in the head”! (irrational and unreasonable); and that’s a severe under-statement! God help us all (or damn THEM all to hell)! Third World War? because of THEM?! Jesus Christ, save us from these evil, insane ‘mad men’! Putin’s hard line is probably due to the fact that Turkey and the regimes in the Mid East have supported ethnic groups from the North Caucasus who immigrated to the region in the 19th century who are recruited to fight Russian forces in Chechnya. The exact same Chechen death squads based in Turkey who launch acts and are fighting the Russians are now being used against Syria. Russian FSB killed a top foreign militant commander in 2004 who was a Syrian. I’m afraid you are wrong there in fact he has since the 60’s been at the forefront since the 60’s of US foreign policy towards control of Eurasia supporting Islamic terrorism in the Balkans, Chechnya and Central Asia. He is also supporting pan Turanianism, who want a unified separatist ethnic Turkish linked states — especially Chechnya to control the Caspian and Eurasian oil and gas from the Caspian through the Balkans and into Europe. Sibel Edmonds has been writing about this recently on her boilingfrogs website and recently did a good interview with the Corbett Report. It is Brzezinski and his family clan that got the exiled foreign minister of the puppet Chechen separatist regime US residence and a NED scholarship who is also involved in the Caspian oil industry in Azerbaijan. Brzezinski or other senior officials don’t have to be Jewish as Islam is just as much a part as the NWO. The only counter balance to the NWO is Orthodox Christianity and Han Chinese nationalism. Slightly off topic but you do some great research Brother Nathanael and write some of the best articles exposing the Jew World Order. Most Christians today believe the Zionist propaganda that the Jews are God’s chosen people (even though they hate Jesus) and the modern state of Israel is part of God’s plan of salvation for Christians. They are therefor seduced into “supporting Israel” no matter what she does - no matter how little the state of Israel reflects Christian behavior as a state. Their cognitive dissonance is pacified by the these Zionist interpretations of the Bible and prophecy. This brings me to the prophecy of Gog and Magog, which we find in Jeremiah, Ezekiel and Revelations. Christians today interpret this as Russian and China allied with Iran. I can remember learning that in the 80’s. It is easy to fall into this because in the 80’s the Soviets were the “evil empire.” Apparently Reagan never looked in the mirror. I have wondered if Gog and Magog refer to the Ashkenazim Jews and their Zionist allies. If so the Bible predicts their defeat and not of Russia. In Revelation it makes it clear there are impostor Jews at work. Most Christians today are completely confused by the Zionist interpretations. Many actually support these Zionist wars. I do not. I think they are on the wrong side of right and wrong. From the perspective of common sense I do not support the US waging war based on the lies of 9/11 to support Israel’s aggression against it’s Arab neighbors. I wondered what your feelings are on this. A first class article here published by Brother Nathanael! Russia and China have many faults and of course there is a dark side to such regimes, but Putin’s Russia seems positively philanthropic compared to the putrid scourge of Anglo-American Zionism now infesting the globe. Remember the nefarious manipulation surrounding the Anglo-American Zionist instigation of World War I. Remember the ruthless Zionist-Imperialist design and execution of the Russian Revolution. Ponder the continuation of world war against Adolf Hitler partly to finally secure a Zionist Jewish homeland and Imperialist foothold in the heart of Islam. The list of Imperialist war and global interference is very long, how can yet another Great Game swindle in the form of the destruction of Syria take place for the whole world to witness. If Erdogan is not a crypto Jew, how come he has suddenly changed his tune and is supporting USrael against Syria –and will allow Israel to use Turkey’s airspace to attack Iran after Syria is vanquished??? Don’t tell me that he is doing this because of the smuggling at its border. He is allowing paid provocateurs to attack Syrian citizens from Turkey’s US base so that the Syrian government can be falsely blamed. Why is he doing exactly what Israel wants? You don’t stab a friend in the back unless you are a Talmudist. The Mavi Marmara appears now to have been a staged event to make it look like Turkey was surprised when Israel attacked the flotilla — but now it seems to have been done with Turkey’s secret nod and approval. The recent resignation of several Turkish military officers looks like the crypto Jewish military is now in charge with crypto Jew Erdogan at the helm. The Jews set out long ago to occupy and destroy the U.S. from within, as part of a larger plan to destroy White European populations. The U.S. Civil War, and WW-I and WW-II are case in point. The Wall St.-Pentagon complex was always, and is still, a Bolshevik Fifth Column within the U.S. It could also be called the Pentagon-to-Walmart (China) complex. It is run by the Soviet of Joint Chiefs, who are headed up by the Vice President. Note that ALL of these power positions are quietly appointed by the Jewish Bankers in back room operations. We vote for a sock-puppet (president) and its ticket — the back parts of “the Ticket” are privately appointed. The U.S. is finished. It is an occupited country. Jewish bankers debt bombed our steel mills and manufacturing plants down to a shambles. With no real industrial capacity, the Pentagon wants to send us off to war. The goal is to destroy us, from within. The enemy is the enemy within. Without a steel-mill or a real economy based on industry, our only choice is to be destroyed by war with Russia or by China. The Chinese are the “Jews” of the Orient. The Russians are White European and, like the U.S. they are slated for extermination. The Jews have always hated White European populations, and they have always intended to destroy the Russia and the U.S. We don’t make good slaves. They would love to see White European populations destroy themselves in more wars between the U.S. and Russia. The Chinese and the Jews then get their free ride into the future. China is the real darling of the Pentagon Bolshevik Jews — because the Chinese populations are naturally obedient and make better slaves. According to Jane Degras, author of Third International (Oxford Univ. Press), Mao was a Pentagon agent. According to CIA training manuals (google “special operations research office” case study vietnam cuba) the Pentagon ran both sides of the Vietnam war. The goal was to help Mao consolidate his dictatorship. Ho Chi Minh was trained and supplied by Gen. Philip E. Gallagher. Within this hemisphere, Fidel Castro was trained by Gen. William Morgan of Ohio. 911 was planned in the 1950s. Both Fidel and Ho were Pentagon agentura. When we are orchestrated into war with Russia, White European peoples will be exterminating each other, precisely to the plans and pleasures of Pentagon Jews and their agentura and slaves in China. The Chinese banking system is privately owned, as are all Chinese military forces. The Communist Party of China is a privately held corporation that owns the central bank and the military. It was setup by the owners of the member banks of the Federal Reserve. It is run by Jews. So, there is now a Bolshevik Fifth Column inside China as well. At some day in the future, perhaps a hundred years away, the Bolsheviks will destroy China from within as well. The Bolshevik Fifth Column known as the Wall St.-to-Pentagon complex also ran, and still runs, both sides of the wars on drugs and the wars on terrors. The goal is to destroy all White European populations from within. It is better that we exterminate ourselves in a war with China than that we exterminate ourselves in a war with Russia. Either way, the Bolshevik Jews of the Wall St.-Pentagon complex have slated the U.S. for extermination. I normally agree with everything that Brother Nathanael speaks of, but in this case my opinion of the article is mixed. I realise that both Russia/Iran and US/Israel are vying for control of the Middle-East which includes Syria. I don’t know how they could have had a hand in the uprising, but to me it seems that for the most part, the protests are legitimate. The media outlets may be providing a skewed version of what happened but videos don’t lie, people are protesting against Assad’s iron grip rule and they are dying as a result. I don’t think it’s fair for Putin to send in an Orthodox bishop to allege support to a man who is openly firing at his citizens, and I know how much Arabs hate Bashar. I agree that I would prefer that Russia gains more influence and I generally support Putin’s agenda, I just think it’s unfair to dismiss the fact that the people ARE rioting and ARE being shot dead! 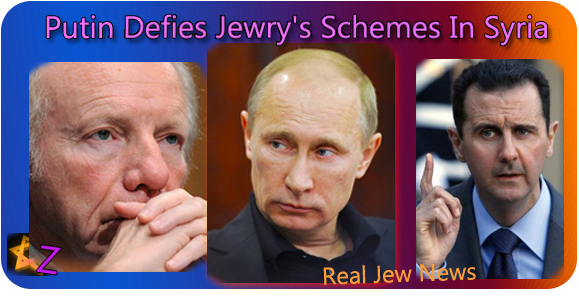 Yes indeed, Jewry is scheming everywhere. Putin very well knows what is going on. A war that will be intentionally started in which the West cannot win due to possible world wide oil/gas shortages for an extended period of time which then will more than likely cause food, fuel shotages and rationing, massive unemployment as well as rioting, and etc. in the West and elsewhere. I see why now, they currently passed that military/detention bill in the U.S. Senate and why they have refused to enforce U.S. immigration laws, they have been planning for this or something similiar for quite some time. I believe Putin to be a gentleman who may actually care for the Russian people more than the other western leaders do for theirs. Perhaps with the re-birth of the SanHedrin, we may see it located elsewhere temporarily? I previously read where Bush endorsed the Noahide Laws, I believe back in 2006? And the British Parliament would prefer to separate from the Angelican Church. We truly don’t have many Christian Governments left in our world. There were several military coup d’états or at least attempts by the Turkish Military in the last decades. They have a secular tradition in Turkey and the military is the keeper of that tradition. Was keeper better said because Erdogan ousted several generals and other high ranking officers. It is unlikely that Zionists have an interest that Islamists take over Turkey. A quote from him is “The mosques are our barracks, the domes our helmets, the minarets our bayonets and the faithful our soldiers… “. He was in prison for that. It is possible the Erdogan made a deal with USrael to get a piece from the cake but I dont think that he is Zionist or Crypto Jew. He was in the last years several times in Germany, visiting his colony. He told his fellow Turks (around 3 million) not to integrate and demanded Turkish schools. Our politicians, especially the president, visit Turkey every now and then to bootlick Erdogan and receive orders. He has imperialistc aims. Syria was for 300 years occupied by Turkey/Ottoman Empire. I think Erdogan wants it back. Turkey has the 2. largest NATO-Army. More soldiers and tanks as West-Germany during the Cold War. For what does Turkey need such an enormous army ? They want their old Empire back, I guess. And that includes Syria. Crypto-Jew or not, you can´t trust him. Get real man. We dont need them here. At least not the truth seeking New Zealanders. Hitler apparently suggested sending them to Madagascar — bet the Madagascarians didnt want them either. Our prime minister ‘John Key’ is supposedly a Jew and a banker — worked a few years as a Federal Reserve adviser. So we got enough problems ahead. Send the Russians over instead along with Putin, and I won’t be so sad. I have followed your work for a long time and very much enjoy your world view. I find it augments my geopolitical perspective, like other commentators such as Rense you bring a reality principle to the proceedings. And boy, are they proceeding at an ever accelerating rate. My submitted piece is rather broad, but serves as a sweeping background to this piece on Syria. I hope you and your discerning readership find it informative and worrisome as I’m sure you will agree the current geopolitical environment is. COLOUR REVOLUTION AND THE COMING WORLD WAR. CUI BONO? In the 90/00s we had the Orange Revolution in Ukraine, the Rose Revolution in Georgia, both of which it is now confirmed were backed and coordinated by NATO/CIA straight out of the Gladio Handbook. Dr Gene Sharp’s protégé Colonel Bob Helvey (1) being in overall command of the recruitment, organization and activation of “Otpor, Kmara and Pora” (OKP) resistance cells tasked with inciting insurrection and non-violent revolt in major urban population centres. This was all coordinated on the ground from the Marriot and Hilton hotels where OKP apparatchiks got their marching orders from the trickle down tyranny officers tasked to spearhead the timing of the uprising. It is no different in the Middle East currently except this time Al Qaeda (AQ), who were present as a destabilizing element in Serbia’s subversion; they are now more prevalent than ever before. - Maintain energy dominance in the region. - Support NATO’s further advance against perceived Russian protectionism. To drive the price of oil upwards aggrandizing Wall St speculation. - To further consolidate private Anglo/American central banking control over independent states. - Continued balkanization of all nonaligned states to maintain destabilized political environment. E.g. Helmand AQ pushed south into Balochistan, pinch point of Pakistan energy corridor, and to destabilize the port of Gwadar, main China sea link to Middle East oil. - To get rid of the “strong men” in the Middle East in order to install democratic (false left/right paradigm) elections through which pro US puppets like Mamdouh Hamza will bring false HOPE AND CHANGE, while they acquiesce to US policies. - To deny Russian and Chinese access to Gulf States and African oil. Watch Sudan as they supply China with 5% of their energy requirements. - The precursors to nuclear war are all basically summed up in these objectives. However, in nuclear proliferation the key element is Rationality, it is the cornerstone upon which all other assumptions are derived. We need look no further than the bios of the Obama White House staff to know that M.A.D. is no deterrence to these people and money is no obstacle, for now at least. Naturally, propping up the dollar is key to the overall implementation of the wider objectives mentioned. US Treasury bill commitments are predominantly foreign held, China tops the table with +$3.2 trillion. And so rather than having to honor them, the open policy is to deny China et cie easy access to Middle East oil and to drive oil to $200 a barrel through high frequency trading and off balance sheet oil reserves accounting to preserve the dollar as the world reserve currency for a decade longer. Whereby these foreign held reserves will go into oil rather than back to the US Treasury, which even now can’t sell fully at auction without the fed, stepping in. Oil is traded internationally in Dollars, we recall that they went back to get Saddam when he started selling oil in Euros, wmds and links to AQ being an insult to our intelligence. But even this global monopoly is not enough to sustain the egregious debts of the M.I.C. TARP, TALF and $140 trillion in FDIC backed CDS’s to top it all off. The PRIVATELY OWNED FOR PROFIT Federal Reserve is buying up US Treasuries at an alarming rate, short term debt is selling as a risk hedge but who wants a 30-year bond at 3%? Current yields don’t reflect anticipated inflationary risks especially as the debt ceiling doesn’t seem to have meaning anymore. This is ultimately a CIA/shadow government/foundation funded/ takeyourpickPAC/Central Banking Power coup. The US through the empty suit Obama and the State Dept Clinton are saying, “We need to listen to the people these strongmen must go”. Yet America has been instrumental in installing most of these men, they funded their regimes and supplied them with arms for decades. As Mossadeq was ousted by a CIA/SIS US/UK power coup followed by the installing of the Shah in 1953, which ultimately led to the upheaval that swept Ayatollah Khomeini and the mullahs into power in Iran during the late 70’s. The same geostrategic policies saw Sadat installed in Egypt giving rise to the radical jihadist ideologies of Sayyid Kutb and Zawihiri in the Middle East and the neocon Cheney-Wolfowicz-Perle faction in the west. Considering that the further entrenchment of these policies under the Obama regime continues unabated, the destabilization, demoralization, crisis and normalization game play will continue to be waged on the entire Middle East and everywhere else for that matter for decades to come. This is the Zbigniew Brzezhinsky (Obama’s main foreign policy advisor, he also ran the Carter administration back in the 70′s) methodology of microstates and ministates. His strategy ultimately results in China and Russia starved of Middle East energy going to war over mutual reserves and destroying each other, leaving America to maintain energy dominance for the rest of the century. Prescribed reading: The Grand Chessboard, The Clash of Civilizations. The people of the Middle East will realize in about 3-5 years that they have been duped into believing that they have won their freedom. Democracy is unfortunately, a cruel hoax and the global players are using every weapon in their arsenal to achieve it. Mubarak was ousted primarily because he stopped price controls on wheat, the staple food in Egypt. Wheat is a securitized commodity on the futures market. It has been speculatively driven up to nearly double its price in less than a year well above historical highs bar the 2008 peak computerized bonanza through Wall st, who cares that it results in starving millions of people. The price of potatoes on the other hand has remained relatively unchanged, as they are not traded in the futures markets. Being Irish, I rather enjoy the odd spud; I wouldn’t want to be paying €50 a bag for them though. Who cares that wheat futures paper derivatives; CBOT (notwithstanding legitimate hedgers) supposedly backed by the CME vastly distorts the price discovery mechanism to the detriment of the world’s poorest people on the verge of acute poverty and the aggrandizement of traders and hedge fund operators. Who cares that the same CME turns a blind eye to John Corzine blowing up MF Global due to bad bets on European debt, leverages to the skies and comingling of customer accounts whose $1.5 + Billion has vanished in one big margin call yet he walks off scott free. The very same John Corzine who penned Obama’s economic recovery plan, he gets a pass and walks off with millions as do the Koch bros et cie who got the call to get out before it blew up. 1. All newly weds used to receive $50,000 from the state. 2. A private home was the basic right of every citizen of Libya. 3. There were no electricity bills in Libya. Electricity was free. 4. The people of Libya paid 0% interest on all loans according to Law. 5. Gadhafi increased the literacy rate from 25% to 83%. Education in state universities was free. 6. Medical expenses in state hospitals were free. 7. The price of the petrol was 14 cents. 8. When Libyan citizen bought a car, 50% was paid for by the state. 9. A large loaf of bread used to cost 15 cents. 10. A Libyan mother used to get $5000 for giving birth. I’m not saying Libya was perfect but it was not as it was portrayed in western media. The fact that Gadhafi was to receive a UN international award for human rights endorsed by dozens of countries such as Italy, Holland, Denmark, Sweden, Spain, Norway, Germany and Australia could hardly be ignored by accident. This should be a smoking gun for people with more than two brain cells, this obviously doesn’t include mainstream reporters, Sky, Fox, BBC et al who went into turbo spin mode on reality. The false left/right paradigm that will be foisted on the Libyan, Algerian, Egyptian, Syrian, Yemeni, Omani, Iranian and Jordanian peoples will facilitate the cooption, outsourcing, asset stripping and balkanization of these once independent nations and deliver them into the hands of the controlling oligarchies. The same masters fund both sides of the political spectrum, because through control of the central banking system, the international financiers and the myrmidons of finance capital dictate and control the actions of governments imposing budgetary and economic constraints at will. Back in the 90s Turkey had 40% of the value of its currency, the Lire, wiped out in 4 days through the foreign exchange mechanism in the City of London and paid off a controlling faction of the Turkish general staff to enforce it. This was done because the incoming government threatened to close down the Central Bank of Turkey and create a system of public credit separate from the Red Shield controlled alternative, a prima facie case of economic terrorism in a modern context. It comes as no surprise so that the Libyan NTC set up a new Central Bank of Libya no longer independent of the BIS controlled hegemonic global banking cartel as it had previously been. After all, “Competition is a sin.” This rabble band of Libyan heroes (AQ) achieved this miraculous feat a mere 13 days into their insurrection. 13 I hear the freemasons among you say, just a coincidence I’m sure. (1)	Source: Obama, The Postmodern Coup. By Webster G Tarpley. Page 253. Outstanding article, dear +BN, and ahead of the curve, as usual in geo-political affairs. “The encirclement of Syria and Lebanon has long been in the works. Since 2001, Washington and NATO have started the process of cordoning off Lebanon and Syria. “The permanent NATO presence in the Eastern Mediterranean and the Syrian Accountability Act are part of this initiative. “It appears that this roadmap is based on a 1996 Israeli document aimed at controlling Syria. The documents name is A Clean Break: A New Strategy for Securing the Realm” [See note, below about ‘The Realm’]. “The 1996 Israeli document, which included prominent U.S. policy figures as authors, calls for “rolling back Syria” in 2000 or afterward. The roadmap outlines pushing the Syrians out of Lebanon, diverting the attention of Damascus by using an anti-Syrian opposition in Lebanon, and then destabilizing Syria with the help of both Jordan and Turkey. “This has all respectively occurred from 2005 to 2011. This is also why the anti-Syrian March 14 Alliance and the Special Tribunal for Lebanon (STL) were created in Lebanon. “…According to the Turkish media, France has sent its military trainers into Turkey and Lebanon to prepare conscripts against Syria. The Lebanese media also suggests the same. “The so-called Free Syrian Army and other NATO-GCC front organizations are also using Turkish and Jordanian territory to stage raids into Syria. Lebanon is also being used to smuggle weapon shipments into Syria. “Many of these weapons were actually arms that the Pentagon had secretly re-directed into Lebanon from Anglo-American occupied Iraq during the George W. Bush Jr. presidency. “The French Foreign Minister, Alain Juppé, has promised the Syrian National Council, that a so-called “humanitarian corridor” will be imposed on Syria. Once again, the Syrian National Council is not an independent entity and therefore Juppé did not really make a promise; he really made a declaration. “While foreign companies like Suncor Energy were forced to leave Libya, they have not left Syria. The reason for that these companies have stayed have been presented as being humanitarian, because they provide domestic local services in Syria. “For example, Suncor Energy helped produce oil for export from Libya, but in Syria produces energy for local consumption. All of the maps on this page make it very clear that the Jews in their grand quest of Zionist Nationalism see themselves as eventual rulers of most Arab lands. However, from the beginning in terms of a nearer realpolitick, even prior to the end of WW1, Zionists advocated a “Jewish State” not just in Palestine, but also in Jordan, southern Lebanon, and the Golan Heights as well. Thank you very much for very interesting article. Putin is great man and Zionists’ propaganda in Poland yesterday said about Putin’s party defeat because he lose support of people and his victory was with many false like wrongly counted votes. I read about it in newspaper. He is retired but still Zionists - he is a ‘good cop’ in American film where are two policeman: bad and the good one. NASA finded a new planet for Zionists, similar to Earth. Biden tells to Israeli Shalom TV, he is a Zionist! Thanks for your data, very illustrative. As far as Castro: there is a 10c. Cuban coin belonging to the after revolution period with the classic masonic emblem on it. Castro has combined all available economic recipes in a very IMF pallatable model for future societies ruled by the NWO: no energy, no goods to buy, near zero salaries and a good medicine to keep the slaves working till the end of their lives. Certainly, the greater Israel is behind Syria´s unrest. 50% of Syria going under Turkey and the other 50% to Israel, Jordan gets the short stick. The missile Shield Radar installed in SE Turkey is another step in the advance of Israel plans. It can control missiles launched from Syria and as it is based in a NATO country so it cannot be neutralized without prompting NATO intervention, and a sooner to be seen warlike scenario before the radar can play any role against IRAN. Before Russia´s oncoming presidential elections, Putin will have to make crucial decisions regarding Syria, which include pressure on Turkey, of the military kind. To have a more clear picture on Erdogan attitudes, we must remember his recent recommendation to Egyptians to become a secular society, not a very Islamic attitude indeed. Turkey´s top military brass accepted quietly and suspiciously every one of Erdogan moves, having into account the fact that masons control Turkish armed forces. His Syrian stance comes under full light to be just a planned strategy as the braek-up up of diplomatic relations with Israel did not include military tides which remain as they were before. It’s good to see the powers that be shift to Russia. There’s no doubt that if it wasn’t for Putin, our Jews would have already given our President Obama the throat cut sign to slaughter Syrians. And our Jews would be giving toast to one another sitting in their mansions watching videos of throats being sliced open of the innocent people that gave Jesus protection from the Jews at the beginning of His revealing to them that He is the Son of God. …not to mention, Russians have a bone to pick with those same stinking rotten Jews and they know it! Being a Canadian and old enough to know better, the American Propaganda was always transparent to me. Though American manufacturing capacity enabled the Allies to win the war, Soviet Russia was the fighting bull of World War 2 . Russia is not to be trifled with unless you’re fond of 400 mega ton hydrogen bombs raining down on you. Putin, too, is not the jelly spine politician we have in the West. Americans are playing their defeat by building missile defense and encircling Russia. Now the Russians and Chinese will build missile defenses. This game America will lose too. They best wake up soon. The reason for S 1687 being introduced at this precise time is to stop all dissent about the upcoming blood bath. This site and others will be shut down and tens of thousands of Americans will be put in FEMA camps. The Zionists are about to top their previous feats of daring, such as the WTC. With one bold concerted move Mr. Putin has turned the mono-polar world and its one “super power” on its head. No doubt Mr. Putin and Mr. Medvedev has signalled the end of the mono-polar world. No doubt the criminals in Tel-Aviv has gone back to the drawing board. By drawing the line in the sand in Syria, the Russians have indicated that they intend to break out of NATO’s encirclement with their so-called missile shield. The Russians would be stupid to let Syria fall by the hands of the Zionist machinery. Syria represents a forward base, a way out of the encirclement and a means of delivering a deadly blow to the enemy once and for all. The theft of the natural resources of the Russian people is still on the agenda of the Rothschilds as when Hitler invaded Russia on June 16th 1941 on behalf of his wall street backers; always has. We should all pray to God to keep Mr. Putin safe and sound. We all saw the Way they butchered our beloved President Kennedy right before our eyes in broad daylight because he was on to what Israel and their Wall Street criminal Kabal was up to. Can you people believe this idiot? U.S. senator John McCain, known for his staunch criticism of Russia, warned Prime Minister Vladimir Putin that Russia would see an “Arab Spring” of its own, following the post-election street protests. “Dear Vlad (Vladimir Putin), The ArabSpring is coming to a neighborhood near you,” McCain said in his Twitter micro blog. Before reading the following “interests” the United States government (with US tax money) is pursing within the sovereign Russian Federation, it may be instructive to know just who constitutes the National Endowment for Democracy, the umbrella organization that funds a literal army of global sedition. (NED’s funding for Russian NGOs is listed last). As painful as it is to even think this truth in my head - it must be said. After years of cummulative information gathering - travel observation and personal experiences I have come to the stark realization of the level of evil that MY OWN COUNTRY has now WILLINGLY steeped itself in - ALL based on a single undeniable inescapable premise - that we have collectively, as a nation, as a people, become the most criminally ignorant creatures on EARTH! I see NOTHING that my country has done within its own bounderies that is REMOTELY Godly, wise, decent, moral, and honorable for MANY years now. Likewise - everything we do in our Jew-directed foreign policies is evil, destructive, devious, treasonous, and devoid of ANY honor or truth or compassion, or even in our own national interest. ALL of what we do is based on greed, ignorance, arrogance, lies, and barbaric violence against the poorest people on earth. We have brought ten times more suffering and misery, death and destruction to innocent people than all the efforts of Communism combined and I do NOT get my consensus from the Jewtube. We have become the TRUE axis of evil - along with the equally immoral degenerate British and the sons of Satan in IsraHELL! This entire nation’s essence is now based on lies upon lies upon lies that never end. We have lost ALL identity - ALL legacy of our Founding Fathers - ALL sense of honor and decorum - all compassion empathy logic and rationality. We are a collective mad rabid dog - a mortal liability to every freedon loving human being on the planet. We are now a nation of fat, lazy, hypocrite imbeciles in permenent denial of truth, honor, courage, responsibility, and goodness - whose greatest aspirations have degenerated into the most vile, putrid, repugnant, rancid, inane, shallow, libidinous lusts for violence, gore, and cheap sensationalism that ‘30 pieces of silver’ can buy! Outside of a handful of gallant, selfless, dedicated Godly souls with whom I have kept faith in this battle against the ultimate evil. I cannot in ANY degree of honesty say that I know a SINGLE, DECENT, INFORMED, RESPONSIBLE, DISCIPLINED, RATIONAL, MORAL, COURAGEOUS HUMAN BEING in my entire community, nor my circle of what I once called friends, nor even my OWN children, nor so much as even ONE TRUE CHRISTIAN place of worship, where I might seek occasional solace, compassion, and sanctuary from the daily sociopathic madness and pure insanity that engulfs every aspect of my life. Even as our society crumbles all about me into madness and self-inflicted moral and econmic genocide, my neighbors (not ONE of which has EVER so much as spent even ONE hour of their time in ANY meaninful endeavor to do ANYTHING remotely truly patriotic), never fail to have their obligatory Sunday afternoon tailgate orgies of madness, screaming, yelling, cheering, drunkeness, and frenzied adulation of some of the most ‘less than useless’ negative mindless ‘role models’ - walking hamburger Neanderthals - like Stupid Bowl troglodytes. It is no longer a occasional diversion for these people. IT IS A SACRED RITUAL - more important than their children’s future - the survival and freedoms of their OWN country - or their immortal souls. If the energies and expenses of just ONE such afternoon of senseless childishness would be diverted to, say, support for and the learning and the inspiration from a truly valuable fountain of knowledge and wisdom like what Brother Nathanael has created from nothing - on his own - for his fellow man - what wonders we could work. What public righteous outrage could be fomented and supported and directed to gaining back our once Christian nation - with its former goodness and traditions now ALL traded for thirty pieces of Jew silver at the temple of Jew entertainment we know as the NFL and Ballywood. Souls are ALL ‘on sale’ in ‘Merka CHEAP! EVERY Friday is ‘BLACK FRIDAY’ for the Jews - but its not just TVs and I-pods and ‘Blackberries’ any more. We have sold our souls and have become nothing more than animals! I encourage all of you to contribute generously. There is NO way to put a price tag on the value of knowledge and wisdom. It is an investement in YOUR FREEDOMS and those of your children. I will be sending another contribution myself shortly. I implore you to do the same - to the best of your ability. ‘Keep the faith’ - people. It, and men like Brother Nathanael, are all we really have left. DO NOT let these evil Jews steal these also. OH yes - and may the grace of our Lord protect and guide the decisions of ‘not for sale to the Jews’ patriot Vladimir Putin in these critical times. BN, good article about Putin and Syria. “Russian Prime Minister Vladimir Putin yesterday called for restraint over the Syria crisis, after talks with his French counterpart who accused President Bashar al-Assad of being deaf to pressure. “”We are calling for restraint and caution. This is our position,” Putin told a news conference, the day after his foreign minister had likened the situation in Syria to a civil war. “Russia has accused the Syrian opposition of stoking the unrest in the country, a position that has irked the West. “French Prime Minister Francois Fillon issued a sterner statement against Damascus, saying Assad was ignoring international calls for reforms and an end to the lethal crackdown on demonstrators. “Diplomats from Germany, France and Britain tabled a resolution condemning human rights abuses by the Syrian government at the UN General Assembly’s human rights committee on Thursday for a vote expected next Tuesday, officials said. Clinton meets with a small group of expatriate Syrian opposition members, the Syrian National Council, at a hotel in Geneva December 6, 2011, openly showing US support. I really admire Vladimar Putin. “U.S. senator John McCain, known for his staunch criticism of Russia, warned Prime Minister Vladimir Putin that Russia would see an “Arab Spring” of its own, following the post-election street protests. I couldn’t believe Alex Jones says today that he’s no fan of Putin, no reason given. If he’s got something against him he should share it with his audience. Since when has he held back why he dislikes someone? And one of his callers was going on about how cold blooded Russians are, and referencing to the time of the Jew Lenin. Putin is stopping from happening everything they been raging against forever, and they can’t throw him one ounce of credit. I would luv for Bibi and Ehud Barak to be put in a room alone with Putin so the Russian tough guy can beat them to a pulp … now that would be some hard line diplomacy and funny at that! Brzezinski is definitely not Jewish; he has a pedigree of high Polish nobility (ksaze), which, btw, does not clear him from being a first-class a-hole and the original engineer of the civil war in Afghanistan. But since the princely nobility in Poland was never offered up for sale the way it was in many other countries, being descended from princes does clear him of being Jewish. That said, many long-time nobles with traces of Jewishness, were patriotically inclined in the case of Imperial Russia since even before Peter the Great’s time. This is according to Solzhenitsyn’s “200 years together,” a historical masterpiece still not available in the English language in its entirety. Yeah, Alex Jones has been consistent in bashing Putin. Forward to 10 minutes…in his point of view, Putin is associated with NWO. Though you’ll find different groups blaming different people. Once again BN, great article. Putin is trying to stop the Jews in Syria, yet he has to fight against Jewish destruction in Russia as well. 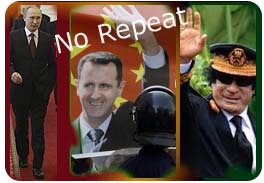 I wonder how much longer till both regimes fall, but I believe Syria and Assad will probably go down the drain in 2012. Obama is behind the present day unrest in all of these Middle East nations so that he can institute his Obama before demonic world order all over the globe. I shall keep praying for Putin and all those who oppose them before we reach certain destruction. Alex Jones is a tool for the Jews and BN has already exposed that Jewish-loving filth as a dis-informer for the Jews. It would be wise to stray away from that useless fool and all that he spits. Feelings of betrayal are always ugly. However, awareness and knowledge of the roots of the aforementioned is the mixed blessing. I have been blessed with the ” hard wiring ” never accepting things at face value and also willing to dig once I have caught wind of an issue. The last few years have been rather tumultuous as ones’ past comfort zone of reality is turned inside -out and upside- down. I also feel blessed seeing fellow human beings who volunteer their time to present the other side and with fearless determination. The Netanyahu government’s Ministry of Immigrant Absorption is sponsoring advertisements in at least five American communities that warn Israeli expatriates that they will lose their identities if they don’t return home. Interesting…..is the apocalypse far behind ? Incredible comments and hilarious as well! Syria, Iran, Egypt, and Greece had played a major role in protecting the kingdoms (North and Judea) from Assyrian invasion. These countries along with China will play a major role during Armageddon and the present wars. China was formally an extension of Persian Peninsula and therefore they will aid Iran in the great wars to come. Russia will play a role in driving out the Khazari apostate Jews from Jerusalem. 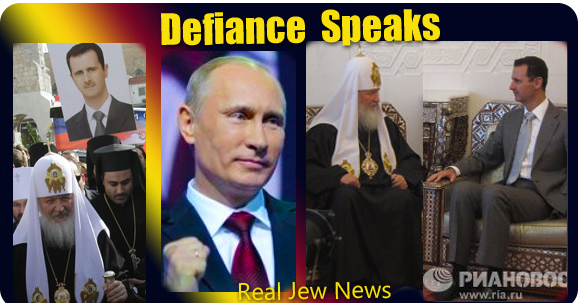 Putin will be a blessing in disguise for the Jewish remnant in the future. Alex might be right in saying that Putin is NWO. All these nations are under the influence of one big Satan which is using the banner - NWO. The S-1865 was expected and if the Jewish Mafia is imposing this military police state here in the U.S., then I can confidently say those same Jews created the bloody war in Germany against their own people - the Sephardic Jews by using Hitler; their puppet like Obama to sign orders. The Jews have the blueprint only now to be used upon the White Man. Their true colors are out in the open day light and their denial of blaming game is over. It was very naive for Syria’s president to allow the sneaky powerful media Jewess, Barbara Walters, to interview him for the Jewish Talmudic American TVland. She and the commentators completely set him up, and are gearing up to end him and Syria, the only country that took all of Iraq’s dispossessed by our warring on them, without question. God bless Syria and also Russia, if she will aid her. I have just read an interesting interview with the Metropolitan Mar Gregorios Yohanna Ibrahim from Syria. 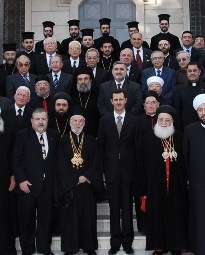 As long as Assad is in power they feel safe and have freedom of worship. The majority of the people in Syria don´t wish an intervention from outside. Assad is an Alawi, Erdogan a Sunni. The Sunnis are trying to take over the country, so no wonder that the Islamist Erdogan is supporting them. The majority of Christians in Syria are supporting Assad. In regard to the comments by the person who only identifies himself as TRUE-NEWS - I wish to add something. Although I tend to support Putin I am ultimately guided by TRUTH over emotion or allegations. I opened your news site and the demonstrations led by the young Atty Navainey charging corruption by Putin’s Party seemed real enough and sincere on the face of it. However, decades of investigative experiences has tempered my final judgement on most issues. Your kind of intelligent questioning is appropriate and necessary in these matters and I am not privied to the whole story. HOWEVER - Here are a couple of interesting, and perhaps not conclusive, nevertheless pertinent snipits of information to consider. #1 The crowd of demonstrators - estimated at approx. 2000 by the officials - was in fact ALSO composed of a significant percentage (20 percent) of COMMUNISTS! Check it out. I find that incriminating. #2 One of the major newspapers there who suported Navainey’s position - ALSO recently posted an article having to do with Soviet Communist theft of atomic secrets from our Manhattan Project (atom bomb) in which they ALSO SUPPORTED this espionage. Hnmmm! The plot thickens. Draw your own conclusions. Remember - I discovered this in a matter of 20 minutes or so. What might a full day of investigation uncover about the TRUTH? Nothing more? a LOT more? Perhaps Bro. Nathanael would like to add his own take on the allegations. Jew York Times weighs in to further stir the pot a few minutes ago, adding to what Joe C. has observed. MOSCOW — Prime Minister Vladimir V. Putin accused Secretary of State Hillary Rodham Clinton on Thursday of inciting unrest in Russia, as he grappled with the prospect of large-scale political protest for the first time in his more than decade-long rule. In a rare personal accusation, Mr. Putin said Ms. Clinton had sent “a signal” to “some actors in our country” after Sunday’s parliamentary elections, which have been condemned as fraudulent by both international and Russian observers. Anger over the elections prompted a demonstration in which thousands chanted “Putin is a thief” and “Russia without Putin,” a development which has deeply unnerved the Kremlin. Speaking to political allies as he announced the formation of his presidential campaign, Mr. Putin said hundreds of millions in “foreign money” was being used to influence Russian politics, and that Ms. Clinton herself had spurred protesters to action. The comments seemed to mark an end to the Obama administration’s sputtering effort to “reset” the relationship between the U.S. and Russia. This is how low they’ll go. The Jew Fox News, made a report on protests in Moscow against Putin and the so called ”election fraud” by Putin. The start of their report showed footage of people rioting against and throwing firebombs, and Fox news was saying that thousands were rioting on the streets on Moscow against Putin. The only problem — The footage they showed was actually footage from the Athens, Greece riots. And the Fox Jew News pretended that it was from Moscow, and the Moscow people were rioting against Putin. The more the US government eats, the more it wants. Perhaps Putin is the last great hope for humanity. They show old demonstrations in Athens and they say it were last days in Moskau!!!! I could cry from laughing!!! What a propaganda!!!! They must fear Putin soooo much!!! Erdogan is a Sabatean, a crypto-Jew. You are my Hero Brother and (I am sure) Jesus in your soul. Also, If ASSAD goes then second Geocide period beginning for poor Armenians. In fact, if and when ASSAD goes, Holocaust comes — NATO needs new markets for new weapons and Jewish Imperialism NWO arranging new reasons for new Genocides. If Assad goes, expect chaos and brutally terrorist looters to come to power, slaughtering Christians, Armenians, and Druze, and Allawis. Real Muslims, too, are in danger, not only Christians. And a whole cultural mosaic, a whole wealth of Syrian civilization under threat of the weapon industry of NWO. The Bolshevik Communist Khazars of Tel Aviv, London and New York fear Putin. Putin has pushed back on the Khazar oligarchs, financed by New York Khazars, who stole a great deal of Russia’s wealth in the aftermath of the collapse of the Soviet Emipre. Putin was late in his doing so, but now he has them on the run, or in prison. For Joe Cortina, I have found a lot of truth about this evil of Zionism. The facts are there, if one is willing to do the research, from Adam Weishaupt to Herzl to Baruch to House to Morgenthau. Alas, it is too late for America. Too many believe all the Khazar lies, from 6 million to 911. Putin resembles a warrior hero in the last days fighting the “synagogue of Shatan” (Persian spelling) before the return of Jesus. Would the real Gog of Magog please stand up! I am from Russia and I am telling you, people, that it is not the best time for Putin. Many betrayed him and many are those who are eager to. In your comments you wrote kind of “…his party won, etc,” and you are right, but I’d like to add here something. First, don’t you know that he is not even a member of the party that called him their leader? This “United Russia” party was organized not by Putin but the initiative for it belonged to ex-mayor of Moscow Luzhkov. As I feel it, Putin has always known the real worth of the people gathered to run the country but had to put up with this fact. And long before the elections he started to organize his movement called “National Front” so that to get distant from those whose corruption reached such a grade that to be in a one bunch with them became unreasonable. The results of elections showed that those “bunch of thugs” (how they were hailed by people), have really surpassed themselves in dirty tricks with bulletins to secure their power. I suspect that “somebody from somewhere” wanted the so-called “Party of Power” to show an as ugly face as possible in order to put a big blame on Putin and to tie Putin in minds of people with flagrant dishonesty at the elections. I think it was a sort of sabotage. Putin didn’t mean it. Now the scenario is evolving according to the “outwardly” plan. He is trying to change the situation giving interviews, explaining the current situation and he is very frank and open, but there are too many of those who are either unable, or don’t want to have an ear for what he is saying. To tell you the truth, the authorities in towns are so corrupted that people don’t believe anybody now and they don’t care who will be next in power,they hate all. I live in a small town and see everything by myself. I wish Vladimir Vladimirivich Putin to win on every front. He is very brave and certain of what he is doing. Excuse my english but it was from my heart. Recently I have been going to Yahoo articles and posting my blogs to no avail. Some make hurtful comments (maybe infiltrators) and some have given me hope with really thoughtful and compassionate comments as well. Yet I know why people post here instead now. Because if there are ignorant and thoughtless comments, such as baised -based and hateful-based, I know you and others on here that want the truth can back me up. Sometimes I go to the local public library to see your website. But sometimes I only can see your page on my phone. And sometimes when I try to go on your site or others talking the truth, I get bumped off. I mean my phone shuts off or goes back to the main menu. This seems wierd and I’m going to investigate. This only happens when I go to these sites. Metro pcs lets you go to any other website it seems, but you go to yours and others pertaining to the Zionist mafia and it seems this happens. Anyway to the subject: I posted on Yahoo about Putin and the “revolts against the leaders of the Middle East.” I told the sheeple to do their homework and see the past. The internet is now a way to see the exposed dictators and traitors without clothes. Yet people still do not want to see. They do not want to connect the dots and see how this Russian matter happened in their past with the Russian Holocaust and how infiltrators for the big bankers have gone into these countries and ran out a “rogue” leader such as Putin. Putin may not be a saint, but he stands in the way of these Zionists in the U.S and Israel from getting at Iran. So what do these traitors and banksters for Israel do: Fund revolts and topple and implement a puppet and take these countries resources and put in debt the poor people. 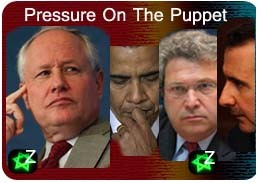 These Zionists create the situation because Russia supports Iran and Putin stands in the way for the takeover. This is also happening in Syria with the revolts against Assad who supports Iran. China also states they will support Iran to the point of WW3. But does U.S. dare go against China? Who knows at this point. But it is frustrating that it just so happens this Putin supports Iran, and at the same time the propaganda media is making Putin look like the bad guy at these elections? How stinky this seems. Bro Nat, I’m just a frustrated helper for truth and justice. Look up for Assad? He is Alawi, but is the Alawite religion crypto-Jewry? I have read some comments about Erdogan being a Zionist or not and I have to unfortunately say that he is. Because before his ridiculous fake phony theater show at the Davos Summit, Erdogan was shaking hands with Ariel Sharon, Ehud Olmert and even the man he yelled at, Shimon Peres. Do not forget that Erdogan is of Georgian descent and many of todays Ashkenazi Jews come from Georgia. He didn’t lift a finger for Palestine, nor did he train militant groups like Hamas or Hezbollah. But he willingly and proudly trained terrorists in Syria, and barked like a rabid dog about the Syrian president not knowing the Syrian rebels were hijacking the protests in Syria and killing religious minorities. He does not even know many of the rebels were Al-Qaida linked. He also even has to deal with Al-CIAda terrorists attacking Turkey (the same terrorists he supports). Erdogan is even more Zionist then the Secularists in Turkey. The Secularists in Turkey say NO to war on Syria at least.